The Samsung Galaxy Tab 10.1 is somewhat an Android tablet royalty way before the new generations of Tab 2 flocked the market this year. Despite being one of the reasons why there is an ongoing dispute between Samsung and Apple, the device still manages to receive an ICS update. Once receiving this good news, you may want to prep your device for the imminent update that you will be receiving. The Android 4.0.4, to be exact, is now rolling out for UK devices and it is understandable that other regions will be catered by this update in the coming weeks. This firmware update holds a 237MB file of Ice Cream Sandwich improvements. Outdated software it may be, ICS still proves to be a good platform for this 2011 Tab. Expect to have the update over the air or you may try to check it using your Samsung Kies software. So this could lead us into a conclusion that Tab 10.1's little brothers (Tab 7.0, 7.7 and 8.5) will also receive this very-welcomed update. Another point to be happy about is that this update is the latest ICS version with (Android 4.0.4), this could bring improvements in battery performance, processing speed and ofcourse the feel of the interface itself. 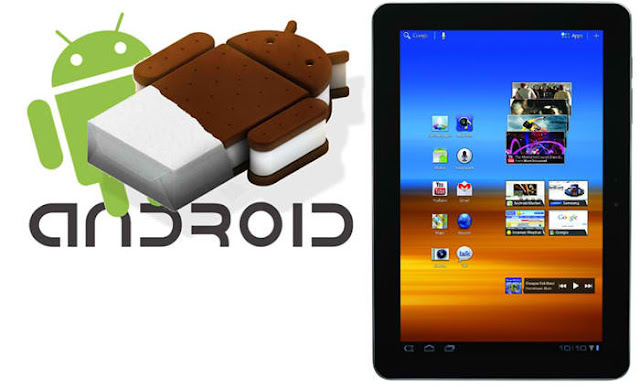 With all eyes focused on the buttery Jelly Bean nowadays, atleast this pushed update to all Galaxy Tab will make users happy.